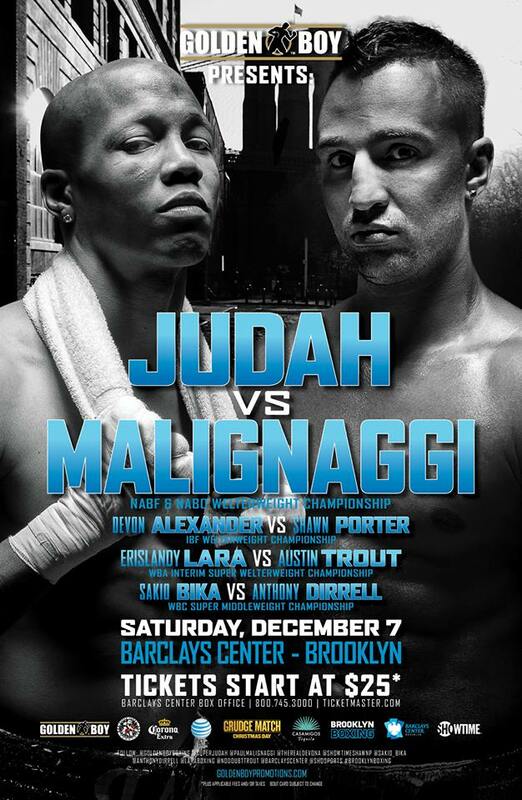 Tickets are currently on sale for Saturday December 7th Golden Boy Promotions Presents: Zab Judah vs. Paul Malignaggi boxing event that will take place at the Barclays Center in Brooklyn, New York. The stacked card will feature several New Yorkers and three championship fights. In the evening’s main event Brooklyn natives and former world champions Zab Judah and Paulie Malignaggi will square off. The contest marks the first time Malignaggi has fought since losing the WBA welterweight title to Adrien Broner in June, and Judah’s first time fighting at the welterweight limit since 2010. In the co-main event of the evening Devon Alexander will defend his WBA welterweight crown against undefeated Shawn Porter, who will be getting his first opportunity at a world championship. A light middleweight title fight will feature New Mexico’s Austin Trout against current interim WBA champion, Erislandy Lara. Trout looks to reclaim a the WBA belt which he lost in his last bout to Saul “Canelo” Alvarez while Lara makes his first defense of the interim title which he claimed in June in a hard-hitting contest against Alfredo Angulo. The first tile sets WBC Super Middleweight champion Sakio Bika against Anthony Dirrell. The card is also expected to feature another Brooklyn resident Daniel Jacobs in a middleweight bout against an unknown opponent as well as former U.S. Olympian Marcus Browne.